....weil 1. hab ich gar keine Zeit nicht für Osterkarten und 2. hab ich ewig für diese eine einzige Karte gebraucht. Sie ist auf jeden Fall nach dem aktuellen Sketch Saturday-Sketch entstanden. 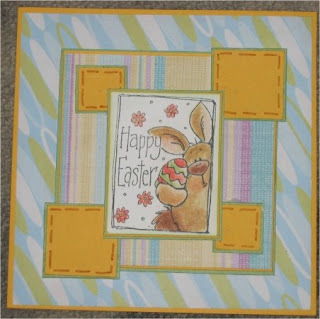 This is my 1st Easter card for this year and it will be the only one, because I don't have the time for some more and well...I did need real much time for this one here. I worked it to the actual Sketch Saturday Sketch. Cute card. I love the bright colours. What an adorable image! Your choice of papers are great too.